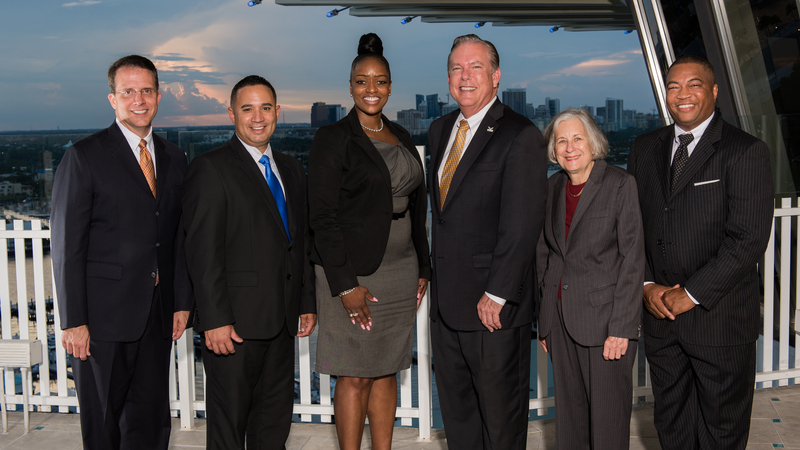 Six graduates of Broward County Public Schools who are community luminaries and champions in education will be inducted into Broward Education Foundation’s Hall of Fame during the Publix Super Markets Charities 2018 “Hall of Fame Breakfast” presented by Memorial Healthcare System at 7:30 a.m. on Friday, October 12 at First Baptist FTL – Global Grille, 301 E. Broward Blvd. in Fort Lauderdale. Supporting sponsorships are available and tickets are $50. In lieu of its annual Lifetime Achievement Award, this year Broward Education Foundation will honor those lost in the February 14th tragedy with the JM Family Enterprises, Inc. Special Tribute to the Marjory Stoneman Douglas 17 Fallen Eagles. Immediately following the breakfast, the BrightStar Credit Union “Walk of Fame” Alumni star unveiling for the honorees will take place at the Broward County Public Schools District Office, 600 S.E. Third Ave., Fort Lauderdale. In addition to Publix Super Markets Charities, Memorial Healthcare System, BrightStar Credit Union, JM Family Enterprises, Inc., Bank of America and Charter Schools of Excellence, other sponsors also include D. Stephenson Construction, Inc., Pier Sixty-Six Hotel & Marina and Wells Fargo. Jeffrey R. Dion, Michael J. Ramirez, Angeline H. Flowers, Bob Swindell, Barbara J. Myrick and Christopher L. Smith will be inducted in to Broward Education Foundation’s Hall of Fame on Oct. 12. Celebrating its 35th Anniversary this year, the nonprofit Broward Education Foundation (BEF) aligns with Broward County Public Schools by providing support for innovative teaching to advance Pre K-12 achievement; critically needed educational materials for Title I school teachers and students, and scholarships for qualified high school seniors. Each year, the Foundation contributes more than $3 million to Broward County schools, serving as the catalyst for educational excellence. Most recently responding to the Stoneman Douglas High School tragedy, Broward Education Foundation initiated a GoFundMe, established the official Stoneman Douglas Victims’ Fund and raised $10.5M for victims’ families, survivors and those impacted.